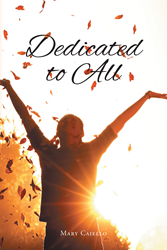 Recent release “Dedicated to All” from Page Publishing author Mary Caiello is a telling and encouraging window into the miracles and strength of conviction. Mary Caiello, a Christian, poet, devoted writer and author, has completed her new book “Dedicated to All”: a gripping and potent work of inspiration and acceptance. This work delves into the idea of self-identity, religion, forgiveness and acceptance. “Throughout my life God has placed me in many different experiences. I am fortunate to say that with his love I have made it through them. When I question, I know he is true in giving. When I was very young, I began writing his words only to end up leading with the answers yes, oh yes, “I Am.” A brief saying, I want to know, for God shall show,” said author Mary Caiello. Published by New York City-based Page Publishing, Mary Caiello’s honest work serves to heal and empower the reader to look for a greater love and trust in God. Caiello concludes, "My God has been very, very true to me. I wrote this book in helping you to learn his words of love and guidance with admiration of you. I bring forth the words 'To Know.' Yes. Believe in yourself because you have earned your right to 'Know' that you are good!" Readers who wish to experience this profound work can purchase “Dedicated to All” at bookstores everywhere, or online at the Apple iTunes store, Kobo, Amazon, Google Play or Barnes and Noble.